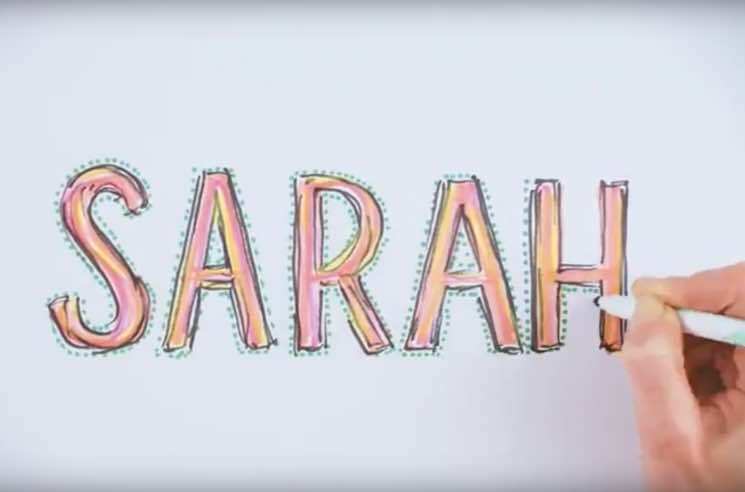 Canadian songstress Sarah Slean recently released her latest LP, Metaphysics, and she's paying homage to her own given name in a new video for a song off that same record. "Sarah" showcases Slean's keen knack for embellishing a heartfelt pop song with "big shiny horns," '70s cop show-esque strings and "a snappy disco beat." The track was initially inspired by the rural farm property she bought back in 2013, and the gut job and rebuild that her home went through perfectly mirrored her creative process with the new album. The accompanying video for the self-referencing tune carries on those DIY ideas in crafty fashion. It was shot over 12 hours and edited over the course of four days, mixing together time-lapse photography, stop-motion animation and video that compiles more than 2,600 still photographs in total. As for the images that appear in front of the camera, they were created with approximately ten Sharpies and a couple pairs of scissors, then lit with two 750-watt lightbulbs — ultimately resulting in an intricate and intriguing visual spectacle. Highlighted amidst the images are Slean's handpainted album covers from a series of limited edition vinyl copies of the album that were released through PledgeMusic. "Paper, glue, scissors, paint and markers — they still feel limitless and never fail to spark inspiration," Slean tells Exclaim! "It's liberating to not 'costume up' and sing to a camera." Slean drew and directed the clip, while Scott Kaija and Ryan Gassi of Light Echo shot and edited it. "Shooting this video was a lot of fun," Gassi adds. "Sarah is a creative force and it was inspiring and exciting to watch her ideas flow and to figure out how to capture them with the camera. Putting it all together was a daunting project, but everything came together smoothly and we love the way it turned out." You can see the results of Kaija, Gassi and Slean's creative collaboration by watching the video premiere for "Sarah" down below.